This walk: 2012-8-15. Bellever Forest, picnic. "She was a vixen when she went to school and though she be but little, she is fierce." - said by Helena about Hermia, in A Midsummer Night's Dream, William Shakespeare, Act 3, Scene 2. 5th Anniversary Cake, bearing the now-obligatory embarrassing photograph! A certain guide in a Stan Laurel pose under a helpful sign post! ..... who were then clearly expected at the Plume of Feathers pub afterwards. Is that really two red telephone boxes - perhaps for very local calls?! MAP: Blue = planned route, the blue lines are the compass or GPS bearings. 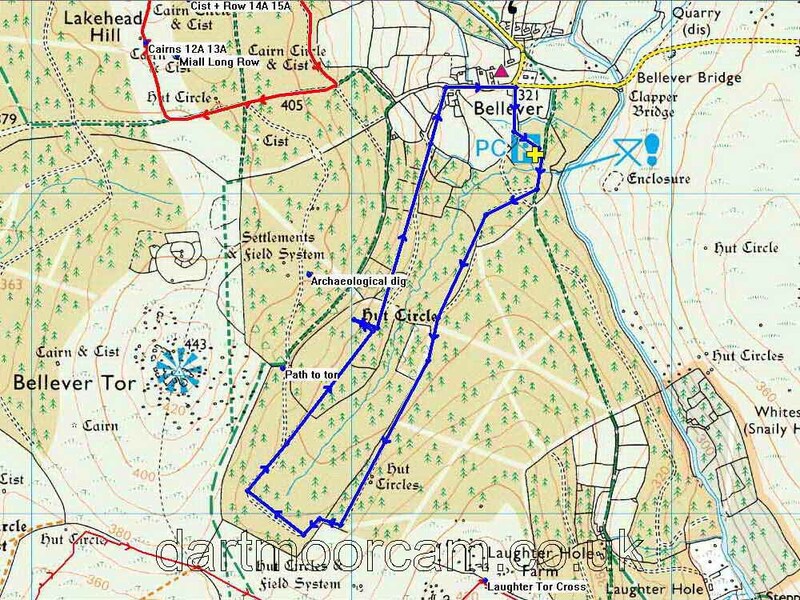 This walk was reached by taking the road south from Postbridge, to Bellever, turning left and then right into the forest to the P symbol on the map (parking fee: �2 for over two hours, although be warned, the machine does not always work, sometimes it will swallow a �1 coin and then reject all others, issuing no ticket - this happened to two of us today).